I moved to Hawaii from Colorado for my first job after college and it was there that I first saw bonsai plants – I was totally impressed. I got some books on these freaks of nature and soon became aware of the relationship to an art form known as ‘Art Nouveau’, or ‘noodle art’ as some refer to it. I loved the furniture, poster illustrations, paintings and the wonderful jewellery. I was taken by the flowing branches and the use of leaves and insects, all so wonderfully arranged. After six years, I moved to the desert part of Washington State and worked out how to cast gold, silver and make jewellery – Art Nouveau style – as a hobby but soon wanted to do larger metal pieces. I discovered some dead contorted sagebrush (Artemisia tridentata) plants while hiking around the desert and they reminded me of the bonsai plants. I scaled up my metal casting and made a bronze casting foundry. Now there was no limit to the size of metal art that I could create. 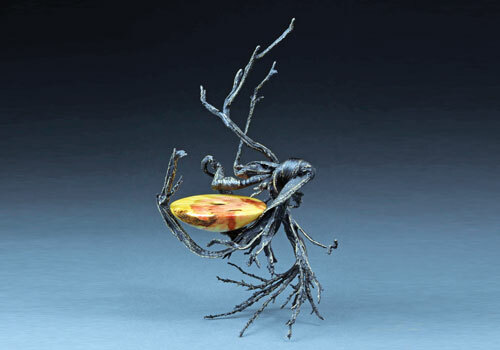 I began casting these fantastic sagebrush bonsai pieces into bronze and combining several of them to make sculptures. A few years later, a friend showed me some hollow vessels he had made on a lathe and I was, again, very impressed. it looked like they were really ready to dance, thus the title ‘Shall We Dance’.